Guillermo Bert, Windy Chien, Lia Cook, Kira Dominguez Hultgren, James Lanahan, Ligorano Reese, Clive McCarthy, Victoria Manganiello & Julian Goldman, Casey Reas and Laura Splan. In 1801, French textile merchant Joseph Marie Jacquard invented the “jacquard machine”, a device fitted to power a loom that simplified the manufacture of textiles. 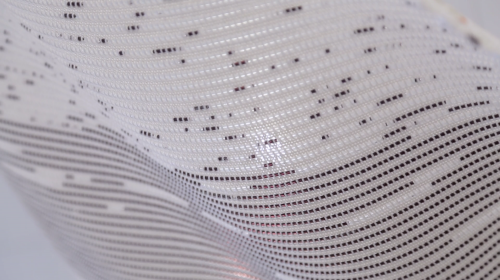 Controlled by a chain of punched cards laced together in a continuous sequence, this new method revolutionized the textile industry. Little did Jacquard realize that his invention would become a national treasure nor that a century and a half later the punched card would be the inspiration for Babbage’s analytical engine, Hollerith’s tabulating machine, IBM’s first computer introduced in the 1940s and 1950s. This exhibition “Stitching and Weaving in the Digital Age” presents the many unexplored relationships between craft and technology and shows through the work of a group of artists, how contemporary art practice has seamlessly embraced both. Many artists employing technology are wanting to strip away the “techy” aspect of their work and return to the “hands-on” approach and feel while weavers are fascinated by the idea of incorporating tech into their craft practice. Innovation is the touchstone of tomorrow. Apple and Google will continue to bring us data solutions and new objects of desire. Emerging technologies in artificial intelligence, data collection embedded in threads and new production methods are currently being applied to the apparel industry while weaving and tapestry are making a strong comeback as an art practice of the 21st century. Contemporary artists always continue to find ways to turn the technologies of the future back into art that subverts their intent. From craft to technology and back, these are all marvelous acts of imagination. CURRENTS 826 is Parallel Studios’ new, year-round exhibition and experience space. In addition to the annual summer CURRENTS NEW MEDIA Festival, this permanent space will continue to increase the community’s interaction with new media arts in an accessible, experimental environment. CURRENTS 826 features interactive art and installations as well as a futuristic gift shop featuring objects fabricated using digital technology.